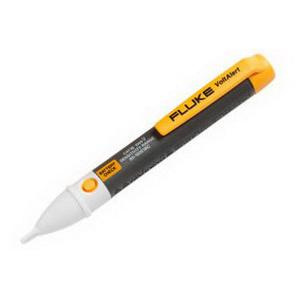 Fluke VoltAlert™ Voltage detector is perfect for wide range of residential, commercial and industrial applications. It has voltage rating of 90 - 1000-Volt AC. This detector comes in integrated clip design. It sense the steady state electrostatic field produced by AC voltage through insulation and tip of the detector glows red to indicate the presence of voltage. This detector withstands temperature rating of -14 to 122 deg F. It comes with two AAA batteries. Voltage detector is UL listed, CSA certified and meets IEC standards.